Updates to Tama's profile since your last visit are highlighted in yellow. Hollie Malamud,born 1968;Bradley Gorman,born 1965;Jonathan Gorman,born 1967;David Gorman,born 1970. I earned my Masters Degree in Guidance and Counseling with a specialty in Human Sexuality at Wayne State University. I retired six years ago after a 40 year career focused on personal counseling in both the private and public sectors. I provided psychotherapeutic and/or rehabilitation assistance to persons with mental health, developmental, and physical disabilities. My last 20 years were devoted to the chronically mentally ill.
My career started at Henry Ford Hospital and other local hospitals, wearing various hats from direct service provider to department head. I also served as president and fund raising chair of various rehabilitation boards. I designed and led workshops on goal setting, sensitivity training regarding disability awareness, employment, personal growth/ human sexuality and effective communication skills. Since my retirement, I volunteer every morning at William Beaumont Hospital Health Center in the Physical Therapy Department therapeutic pool, where I assist the physical therapists with patients and teach arthritic aquatics classes. In addition to my work at the Beaumont pool, I serve on patient advisory boards. When not doing my volunteer work I enjoy traveling, reading, movies and being with my husband, family, friends and our dog, Wolfie. Life is good! Adam,born 1993;Emily,born 1996;Hannah,born 2003(Brad's children). Harrison,born 2005 (Jon's son). Eli,born 2008 (David's son). 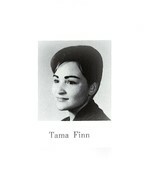 Tama Finn Gorman has a birthday today. Tama Finn Gorman has a birthday today. New comment added.